Lightweight, agile, fast, seakindly, economical and quiet — you’ll find these qualities and more in the MJM Yachts 35z. 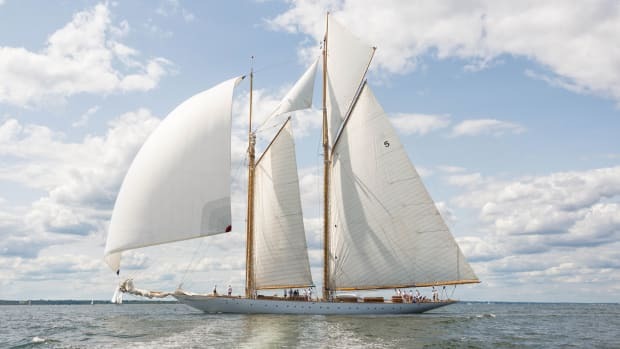 I met her at Newport Shipyard in Rhode Island this past July. Tied stern-to-stern with the company’s 50z, the newest member of the MJM line seemed tiny. (Or maybe the 50z just seemed large.) 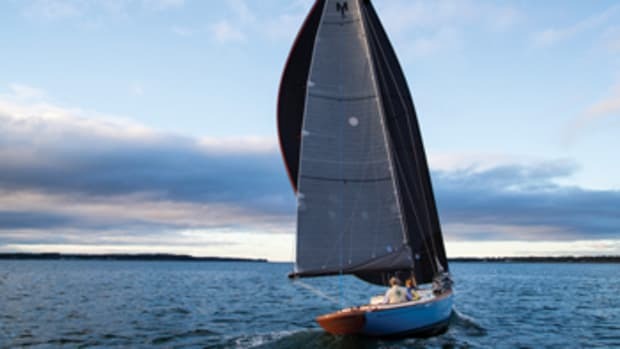 Whatever the case, both models share the genetic makeup of the 34z, which company founder Bob Johnstone, designer Doug Zurn and builder Mark Lindsay of Boston BoatWorks established about 10 years ago. 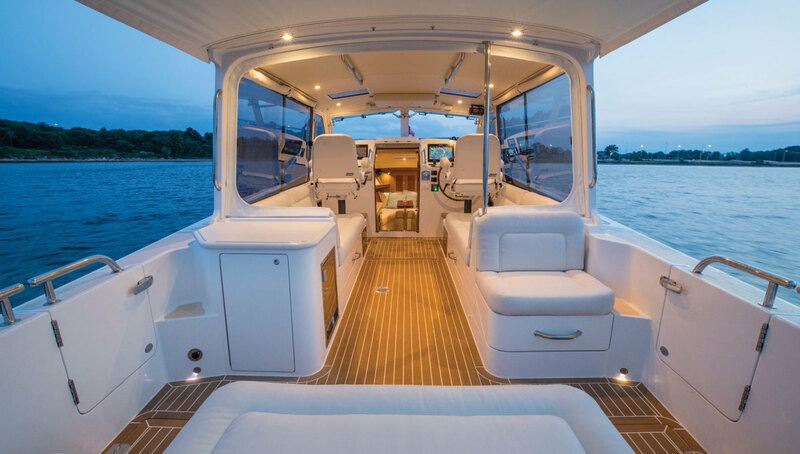 Powered by a 380-hp Yanmar diesel, the 34z was just enough boat for two — or one, which was Johnstone’s goal. 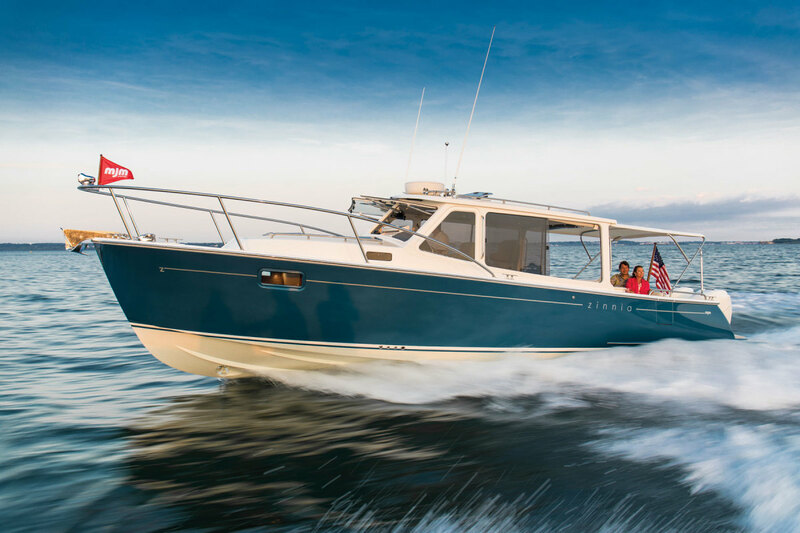 The 35z perpetuates this lineage but does so with a pair of 300-hp Mercury Verado outboards with Mercury’s astonishing SmartCraft digital-boat package. The word astonishing may seem hyperbolic, but I cut my teeth on tiller-steered, outboard-powered skiffs, and to me the breathless description falls short. As MJM’s Chris Hughes maneuvered the 35z from her tight parallel parking spot, I watched the outboards breakdance to the joystick’s tune, each one turning this way and that. 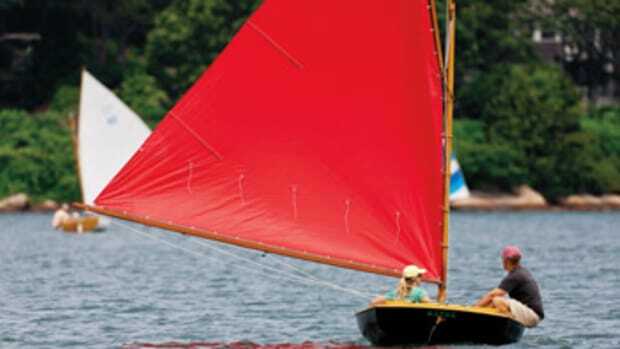 We edged sideways, cleared the classic sailboat on our bow and motored toward the harbor and Narragansett Bay. With engines idling, the sound level at the helm was 65 decibels, roughly the same level as normal conversation. Why outboards? you might ask. Other than requiring you to cope with highly volatile fuel, modern outboards don’t have any shortcomings. In addition to being quiet, dependable and frugal, they open space in the hull for stowage without the need for excessive freeboard. You can perform routine checkups in the open air, and if an engine suffers a serious problem, simply pluck it from the mount and haul it to the shop for repair. The latest outboards even look good, especially when they’re painted to match the boat. 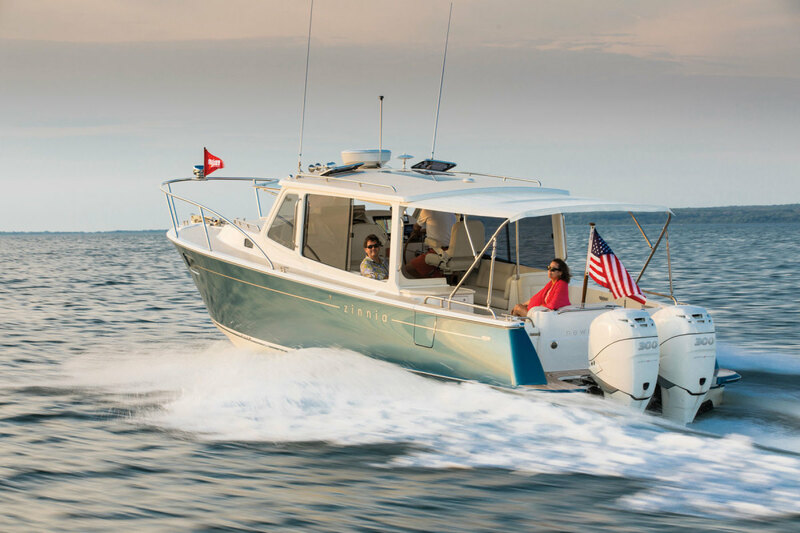 From a boatbuilder’s perspective, offering midsize outboard-powered boats makes good sense because the demand is growing. Newport Harbor in summer buzzes with to-ing and fro-ing, but at 0800 on this foggy Tuesday, we had the water nearly to ourselves, making our perception of the no-wake zone grow as we headed toward Fort Adams. The wind blew 5 to 6 knots out of the south-southeast as we turned the corner and headed toward Castle Hill Light, its foghorn calling caution every 10 seconds. Mercury Marine’s inline 6-cylinder Verado engines are supercharged, which gives them a relatively flat torque curve. (Torque peaks early and holds well into the rpm range.) Throttle response is close, or equal, to that of naturally aspirated engines. An inline 6 also has excellent inherent balance characteristics, second only to a 60- degree V-12. This reduces vibration and the noise related to it. At last clear of the no-wake zone, Hughes opened the throttles to the stops, and the lightweight 35z lifted as a unit and darted toward the open North Atlantic. If she has a hump between displacement and planing speeds, I didn’t notice it. She also felt planted at all speeds, in tune with her environment like a good sports car. The main deck has Stidd seats that pivot to face aft and lower to create berths. Large sliding side windows and optional power-operated windshield panels open to the elements in fair weather. She gets her exemplary dynamic stability and fine handling traits from Zurn’s juggling of weight distribution and bottom design. Longitudinal center of gravity determines a boat’s balance, the point around which it pivots up, down and side to side. A poorly balanced boat may chine-walk, porpoise or broach. It may require more time than is ideal to plane, increase the speed at which it planes or run at a less than optimum planing angle. The 35z’s cutaway forefoot keeps her from steering by the bow, with the sharp entry and steep deadrise softening her ride in big seas. From this fine entry, the bottom transitions smoothly aft to 19.7 degrees of deadrise, which remains constant over the remaining third of the length to the transom. This is the primary running, or planing, surface. A quartet of strakes and two down-angle chines create lift, reduce spray and enhance the MJM 35z’s dynamic stability. The water in East Passage off Castle Hill is deep and maintains a high percentage of maximum depth close to the rocky shore. We had a lot of room to wring the MJM’s neck. Hard to port, the boat leaned on her inside chine and carved a perfect turn, losing only a handful of revs in the process. Mercury’s Active Trim gets a lot of credit for this handling. Its built-in GPS is programmed to match a variety of the boat’s characteristics, enabling Active Trim to adjust the engine’s trim continuously to match speed and weight distribution. It’s sensitive enough to change trim when one passenger moves from the bow to the stern. 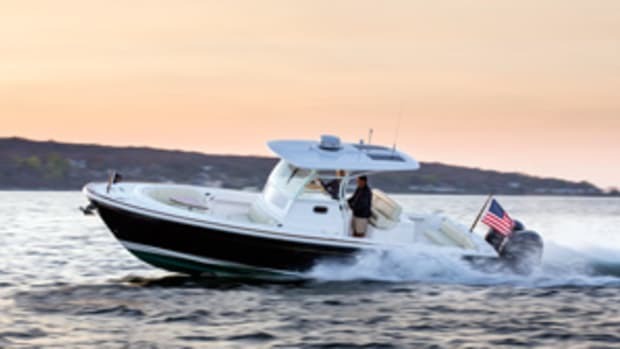 As the 35z accelerates from full stop, Active Trim tucks the lower units toward the transom to increase lift, and as the boat gains speed, the system trims out and lowers the bow. It’s eerie, but oh so pleasant. Steering was silky smooth and can be programmed to a variety of ratios — from sports-car quick to touring-car moderate. Our test boat had the optional Seakeeper 3 gyro stabilizer. It operates so seamlessly that you don’t realize how effective it is until you switch it off. We created rollers with our wake, turned beam-to and disengaged the Seakeeper. The 35z has a relatively quick roll, damped by the chines. It’s not unpleasant, but you must be careful as you move around the boat. 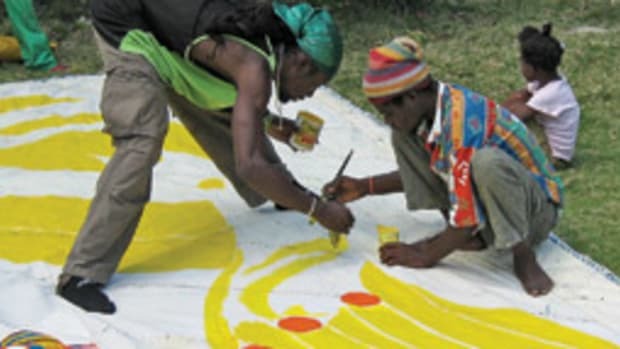 Engaging the Seakeeper makes the rolling motion disappear. Lightweight construction has been part of the MJM credo since the company’s beginning. Lightweight boats are faster than heavy boats for a given power package, burn less fuel and permit a low vertical center of gravity, which lets the boat respond more quickly and easily to inputs from the helm. Also, the lower the VCG, the more initial stability a boat will have. MJM uses wet prepreg, postcure epoxy composite construction to achieve its goals. All models are built to scantlings of the International Marine Certification Institute so they can be certified at the highest possible rating for safety and seaworthiness. The 50z and 40z are ISO-certified Category A Ocean. The 29z, 34z, 35z and 36z are certified Category B Offshore, the highest possible for a vessel of less than 40 feet. Below, there’s a V-berth forward, a wet head to starboard and a galley opposite. Stowage spaces are plentiful throughout the 35z. High-tech composite construction is expensive, and some members of the marine industry think the benefits are lost on most buyers. On the other hand, stick-built furniture below deck and varnished teak or mahogany trim topside also are expensive — and heavy. Although the 35z doesn’t have any wood on the exterior, it has enough of it below to warm your heart and tickle your traditionalist fancies. The cabin sole is teak and holly, and the joinery is Herreshoff-style cherry. 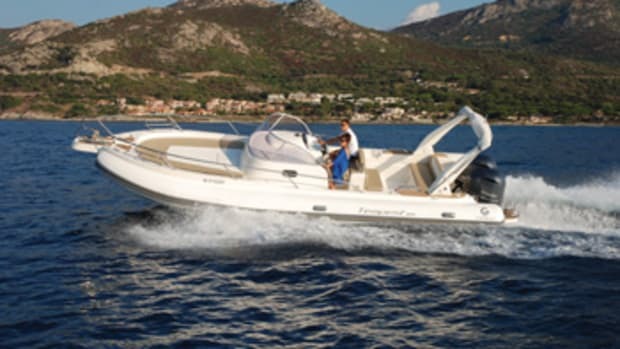 All MJM models are narrow for their length in the interest of performance and seakeeping, and the characteristic reduces the amount of volume below deck. Intelligent design, however, makes the best of this space. The 35z’s general arrangement plan places a V-berth forward, wet head to starboard at the base of the companionway and the galley opposite. A filler cushion converts the V-berth to a double. Every space left over from housing the main items goes to stowage — molded-in lockers under the berth, hanging locker, drawers at the galley and shelves. Her galley has a single-burner ceramic cooktop, a stainless steel sink, a Vitrifrigo 2.6-cubic-foot drawer refrigerator and trash bin as standard. 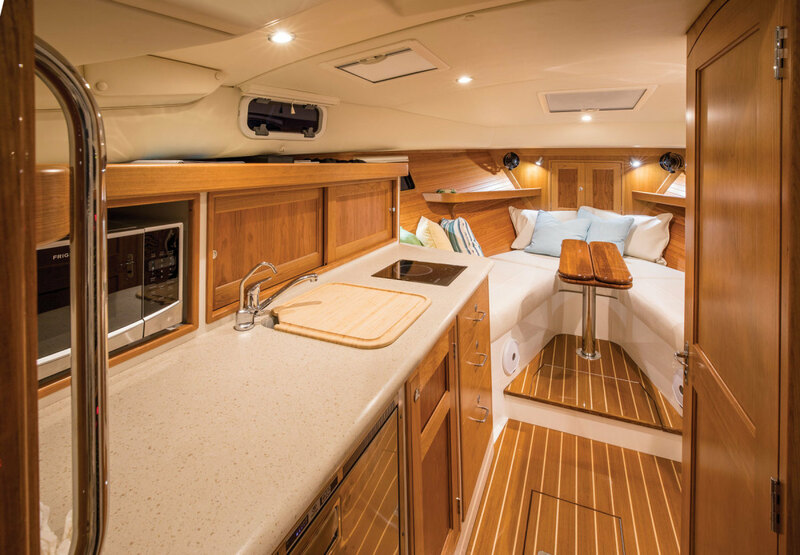 Owners will spend most of their time on the main deck, lounging on the settees, perched on the Stidd buddy seat or at the helm. Both Stidds pivot to face aft and lower to extend the length of each settee for sleeping. 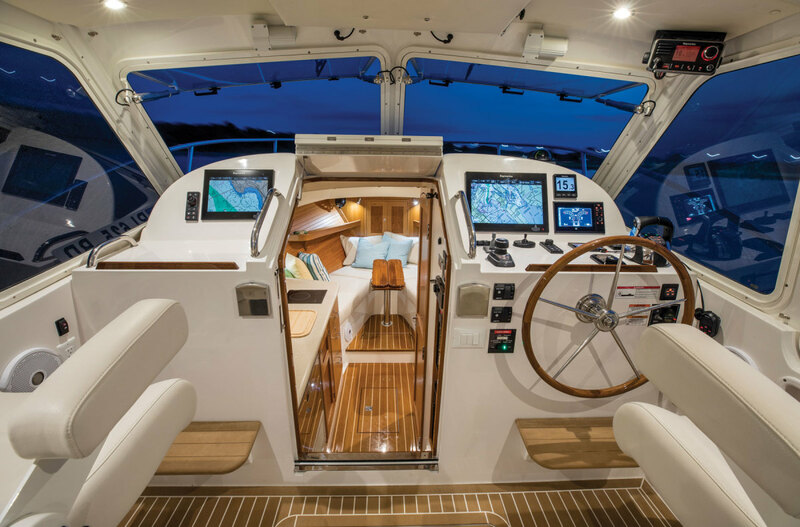 Sliding side windows, which are big enough to step through, and the optional power-operated windshield panels keep the pilothouse awash with fresh air. The Seakeeper is beneath the helm, and the Westerbeke gasoline generator occupies the lazarette. The area between the two contains stowage lockers big enough to hold two full-size bicycles. 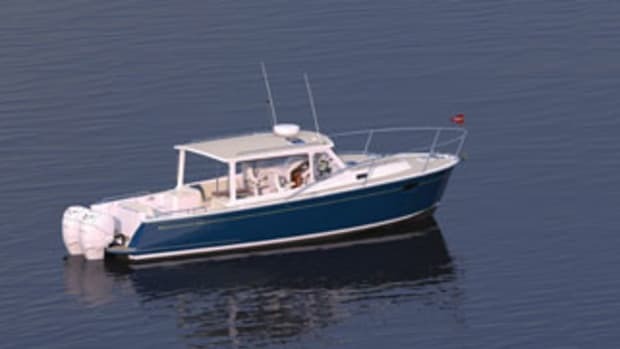 MJM’s boats offer a unique combination of traditional style, practicality and spirited performance. The 35z could be the perfect boat for a couple — or one — to enjoy for a lifetime.